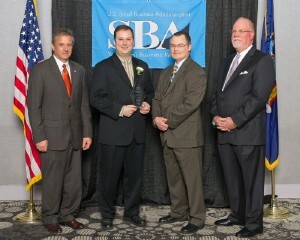 OSWEGO- Local business Oswego Sub Shop was honored last Monday with an SBA Small Business Excellence Award at the DoubleTree Hotel in East Syracuse. From left: Bernard J. Paprocki, SBA Syracuse district director, William Greene, Jr., owner of Oswego Sub Shop, L. Michael Treadwell, Operation Oswego County executive director, and Patrick MacKrell, president & CEO of New York Business Development Corporation. The U.S. Small Business Administration and the New York Business Development Corporation hosted the 13th annual luncheon to recognize the achievements of local small businesses. Operation Oswego County nominated Oswego Sub Shop for the award. The Oswego Sub Shop, located in the City of Oswego, has been in operation since 1969. Currently owned and operated by third generation owner William Greene, Jr., the sub shop has increased the number of menu items and sales each year. One of their popular subs is named for SUNY Oswego graduate, Al Roker of NBC’s Today Show. With an eye to improving efficiency and the quality of bread products, Greene recently started the Oswego Baking and Catering Company. Sales continue to rise with the expansion. 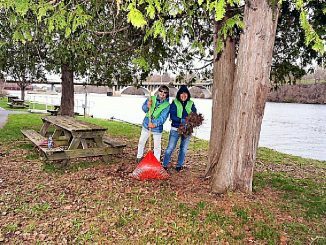 “We had a lot of help to get here today. Most of all, Dave Daino from Operation Oswego County, Mike Quenville from Pathfinder Bank, and Larry Perras from the Oswego SBDC. I’d also like to thank my father for growing the business into a legendary icon through a recipe of passion, service and quality. Through the expansion, we’ve doubled the size of the building and with the help of SBA, it’s been a great transition and improvement,” said William Greene, Jr. as he accepted the Excellence Award in front of 260 luncheon attendees. Small businesses are selected for the Excellence Awards based on their company’s longevity, innovation, sales growth, increased employment, ability to overcome adversity or community contributions.